Improved performance, solid construction and better compatibility, but still pricey. Improved circuitry and converters. DSP integration for low-latency monitoring. Expanded compatibility with 'Tools and other DAWs. Small, solid construction means that the Mbox is a highly portable bit of kit. The Mbox crams a good number of connections into its small surface area. Avid has finally revamped the Mbox product range, with a new Pro Tools Mbox, Mbox Mini and Mbox Pro. All offer a new rugged metal design and improved professional-grade circuitry and converters. There's new DSP processing for enhanced low-latency monitoring (though this perk is missing from the Mbox Mini), as well as better compatibility with other DAWs. "It's not cheap, but it bundles perfectly with Pro Tools LE and other DAWs in a powerful system." While we will be focussing on the standard Mbox in this review, it's worth mentioning some of the features of its bigger brother. The Mbox Pro, works via FireWire (the basic model is USB 2.0) and provides more I/O options and additional metering features, but its size is getting rather ungainly for backpacking. Meanwhile at the other end of the scale the Mbox Mini provides maximum portability, but just one microphone input, no MIDI options and no DSP for cue-mixing. The whole range has a darker, more professional layout that ditches the familiar blue and silver colours of the older models with a simpler and solid construction. We've thrown this Mbox around a bit during the course of testing and it's survived every knock and scrape. We'd definitely have no problem recommending it for portable recording though that all-metal chassis does mean it weighs in at 1.5kg. Like the original Mbox model, the unit features two XLR/TRS combo input jacks for microphone and line level signals, as well as two DI inputs to plug directly into the unit. Each input has a microphone preamp with 48V phantom power, a soft-clip limiter, and its own gain/trim control that, when pulled out, applies a -20dB attenuation to the incoming signal. Neat. The source for each input can be selected individually, the Front/ Rear switch toggles between the XLR/TRS combo socket at the rear and the Instrument input at the front. The placement of the instrument socket at the front of the unit is great for quickly plugging in guitars and it's clear that they've thought hard about practicality and effectively with minimum compromises to keep the price and size down. There are two independent stereo outputs: one analogue and one digital with the analogue output available for speakers and headphones simultaneously. Handily the headphone socket is placed at the front of the unit, next to a dedicated knob for phones volume control. As for the speakers output, Avid has re-designed the level control, implementing a bigger knob for easier and more accurate monitoring levels and this knob, along with all the other controllers of the unit feel very solid and responsive. There's even a Dim switch which is a neat, more 'pro' feature on an essentially 'basic' interface and a Mono switch that sums the left and right channels in the centre, to check phase issues and mono-compatibility of the mixes. Both are welcome additions. A single LED next to each input gain control, indicates signal presence (green) or clipping (red) and these also double as an instrument tuner, by pressing the Dim and Mono buttons simultaneously, which is a handy extra. The best new addition of the new Mbox and Mbox Pro, is that they now come packed with internal DSP for cue-mixing and effects. The DSP chips are built into the unit and are controlled from software and although they can't be used as processing devices when mixing inside the DAW, they work great for recording and over-dubbing. On the downside, when changing the control values in the driver control panel you do get a little noise on the outputs, but if CPU power of the host computer is a problem these DSP-based effects are a real help and can take the strain. The supplied software even includes a large number of compatible instruments and plugs in AudioSuite and RTAS formats, along with Pro Tools LE, where the 'Multi' button can be assigned to multiple operations. 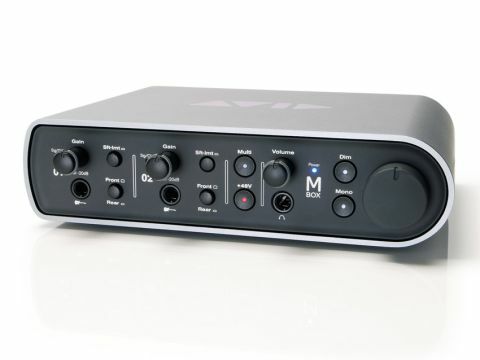 Avid understands that nowadays, quality should not be a sacrifice for project studio owners, which is why they have incorporated improved circuitry and AD/DA converters into the new Mboxes. We found this new unit much quieter than the older model, however, the preamps are still a little noisy for low-level signals. That said the addition of the Soft-Limit function - previously available only in the 192 I/O interface - prevents hard-clipping of the incoming signal, allowing higher recording levels and offering a much warmer limited and over-driven sound. Another surprising and long awaited improvement is the capability of 96kHz sample rates, previously only available on the Mbox Pro (which incidentally can now handle up to 192kHz). For the travelling musician or personal studio owner, the new Mbox improves the recording experience in Pro Tools LE and compatible applications, with the implemented monitoring DSP and software. For editing and mixing, the actual unit doesn't add much compared to the older Mbox versions, but little things like the improved circuitry, built-in tuner and the bigger volume knob are always welcome.